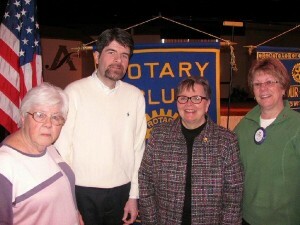 OSWEGO, NY – Board members Peg McKinstry and Justin White from the Richardson-Bates House Museum spoke to members of Oswego Rotary recently. White gave a brief overview of the museum and its rich local history with McKinstry following up on learning opportunities for visitors to the museum, hours of operation, membership for anyone with an interest in preserving local history and upcoming events. The Richardson-Bates House falls under the auspices of the Oswego County Historical Society, founded in 1896, to preserve and promote the history of the greater Oswego community. The 19th century Italian Villa was gifted to the society in 1946 and serves as the permanent headquarters. The house is listed on the National Register of Historic Places and is a distinctive landmark offering a unique glimpse into the lifestyle of prominent Oswego families, as well as a museum dedicated to the vast history of the people, places and events of Oswego County.